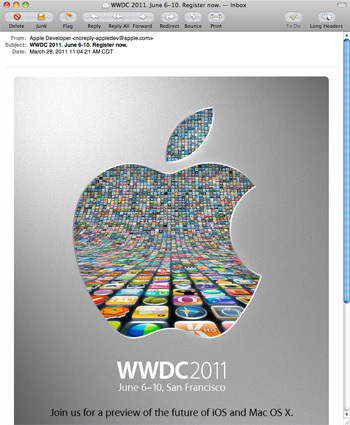 WWDC set for June 6-10, 2011 | UPDATE: SOLD OUT! We opened up our inboxes this morning to be welcomed by a stack of notices from Apple… World Wide Developers Conference has been set for June 6-10 in San Francisco, CA. One shocking item that is starting to creep up online from extremely credible sources (DaringFireball, NYT) that there will not be a hardware announcement this year. For the last several years, Apple has taken the WWDC stage to announce the latest iPhone/iPad. This year appears to be centering around iOS and MacOS. We have already seen a preview (and are currently testing here at DLP) of OS X Lion (10.7). However, rumors are swirling as to what iOS 5 will entail. While WWDC is for developers, Apple’s special magic has always included the strong integration between the OS and the hardware — making the whole widget equals better widgets. By revealing the “next new thing” to developers, the company has traditionally pushed developers to begin considering new hardware features before the gear is generally available. This is good for consumers, who then have apps which exploit new features when the hardware becomes available. UPDATE: We here at DLP were actually looking forward to getting a chance to go this year. Unfortunately for us, we though we would have a LITTLE bit of time to get things in order… figure out how many, etc. We didn’t. WWDC has officially sold out in less than 12 hours! For comparison, the previous record was last year, which took 9 days.